It looked like the rolled knit embellishment I used on my “Strip Tees” last month at Fashion Sewing Club. Which made me wonder if I was limited to cotton/lycra knits for this method or if some of the rayon and poly knits were candidates. So I sewed a few strips together, got them wet and threw them into the dryer. Unfortunately these are remnants from my stash so I can’t say exactly what the content is but, for me, the bottom line is: It’s worth the time to make a mock up and be sure I’ll get the roll I want. Now to the sewing table to copy the tees! 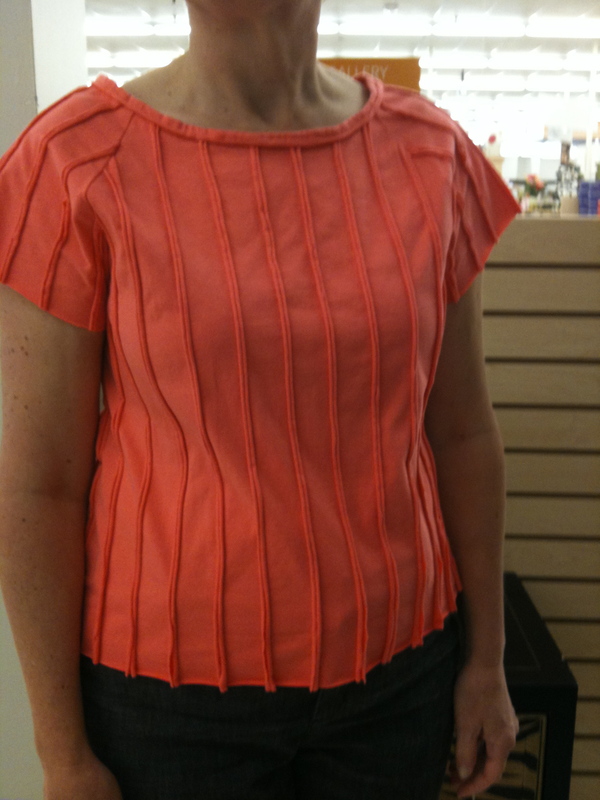 Posted on August 23, 2011 by KristinPosted in Fabric, PhotosTagged Fashion Sewing Club, knits, Talbots, tees. Next Next post: Fashion Sewing Club at Expo! !